Keeping your lawn healthy, green and lush in the summer is often difficult, especially is your area is experience a lack of rainfall. Droughts can easily dry out and destroy a lawn if the lawn is not prepared and maintained properly. Most of us want to keep a well-maintained lawn all year long because it really can beautify someone’s house. Luckily with these 5 tips, you can keep your lawn green and healthy even while experiencing a drought. When watering your lawn, try to water it early in the morning. During this time of day, the temperature is significantly cooler, allowing more water to be absorbed by the soil instead of evaporating in a hotter temperature. Watering during the day wastes water and doesn’t reach the roots of your grass effectively. Watering in the evening actually promotes fungus and disease, so try to avoid watering at this time. In addition to watering your lawn early in the day, you should also start a practice called deep watering. Deep watering requires you to water grass with at least an inch of water for every 12 inches of grass. This takes longer, however deep watering only requires you to water the lawn once every 3 days. This practice will help to ensure that enough water is reaching the roots of your grass and nourishing the blades appropriately to overcome drought conditions in your area or region.This method can really make a difference with keeping your lawn vivid and lush. Especially if you have a newly sprouted lawn, a thin layer of mulching straw can be very helpful in protecting the lawn and allowing it to grow properly. The straw can then be removed about three weeks after germination. Grass clippings can also work in the same way to protect the grass and soil from heat and allow water to be retained more easily. Just make sure not to leave too many grass clippings, since this can actually cause soggy clumps and can even smother the grass. Allow grass to grow longer in the summer. While cutting the grass is important, you don’t want to cut grass too short or too often. 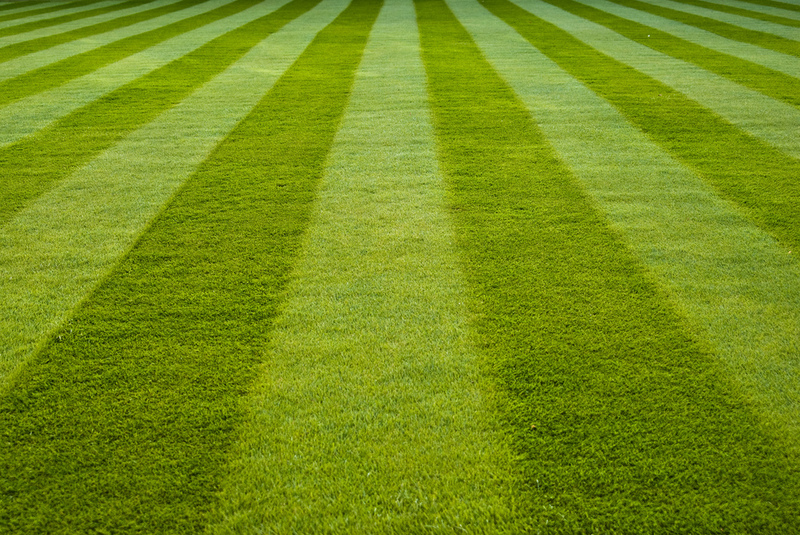 Cutting more than one third of the blades can potentially affect the growth of grass, so make sure not to overdo it. Allow grass to grow as long as possible, without it looking messy. You just want to make sure the blades don’t start looking like weeds instead of grass. The longer blades will be able to protect the crown where new growth develops, keeping grass healthier. When cutting grass, make sure that your mower blades are sharpened. When grass is cut with a sharp blade, it is easier for the grass to grow back and repair itself. If cut with a ragged or dull blade, it is much more difficult for the grass to grow back properly. Using these tips and strategies can help you to maintain your lawn and overcome drought conditions your area may experience in the summer season. Water early in the morning, use deep watering practices, use mulch to protect a new lawn, let your grass grow longer than usual, and sharpen your mower blades as needed. These practices will help you to achieve cutting edge grass that you can enjoy all summer long. Having a maintained lawn during the summer will make you and your family have a more enjoyable experience. Plus, your yard and home will look fantastic and you can enjoy entertaining or watching kids play in the yard throughout the summer months.